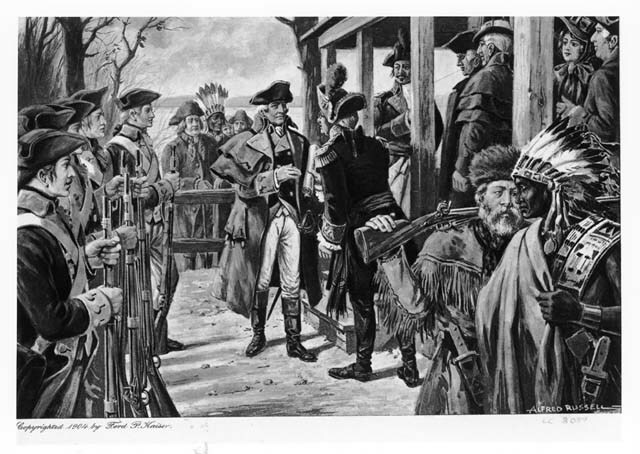 On this date in 1803 France and the U.S. signed the Louisiana Purchase Treaty. The Louisiana Purchase was the acquisition of the Louisiana territory (828,000 square miles) by the United States from France at a cost of fifty million francs ($11,250,000 USD) plus a cancellation of debts worth eighteen million francs ($3,750,000 USD), for a total of sixty-eight million francs ($15,000,000 USD), which averages to approximately four cents per acre. Adjusting for inflation, the modern financial equivalent spent for the Purchase is approximately $236 million in 2014 U.S. dollars which averages to less than forty-two cents per acre). The Louisiana territory included land from fifteen present U.S. states and two Canadian provinces. The territory contained land that forms Arkansas, Missouri, Iowa, Oklahoma, Kansas, and Nebraska; the area of Minnesota that is west of the Mississippi River; a large portion of North Dakota; a large portion of South Dakota; the northeastern section of New Mexico; the northern portion of Texas; the area of Montana, Wyoming, and Colorado east of the Continental Divide; Louisiana west of the Mississippi River (plus New Orleans); and small portions of land that form the Canadian provinces of Alberta and Saskatchewan. France controlled the Louisiana territory from 1699 until it was ceded to Spain in 1762. 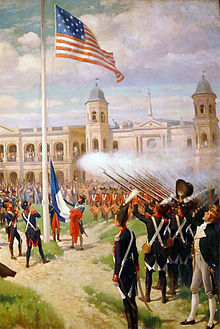 In the hope of re-establishing an empire in North America, France regained control of the Louisiana territory in 1800 under the rule of Napoleon Bonaparte. A slave revolt in Haiti and an impending war with Great Britain led French officials to sell the Louisiana territory to the United States, who originally sought to purchase only the city of New Orleans and its adjacent lands. The Louisiana Purchase occurred during the term of United States President Thomas Jefferson. Before the purchase was finalized, the decision faced domestic opposition as some argued that it was unconstitutional for President Jefferson to acquire the territory. Jefferson agreed that the U.S. Constitution did not contain provisions for acquiring territory, but decided to proceed with the acquisition, being advised that the Louisiana Purchase was within the strictest interpretation of the Constitution, which allowed the President to negotiate treaties. The purchase included an agreement to remove France’s presence in the territory and protect U.S. trade access to the port of New Orleans and the Mississippi River. Throughout the second half of the 18th century, Louisiana was a pawn on the chessboard of European politics. It was originally claimed by Spain but subsequently settled by the French, who established the colony as part of New France. Following French defeat in the Seven Years’ War, Spain regained control of the territory. As the lands were being gradually settled by United States immigrants, many Americans, including Jefferson, assumed that the territory would be acquired “piece by piece.” The risk of another power taking it from a weakened Spain made a “profound reconsideration” of this policy necessary. The city of New Orleans controlled the mouth of the Mississippi River; other ports were established, but only New Orleans had direct access from the Mississippi to the Gulf of Mexico. New Orleans was already important for shipping agricultural goods to and from the parts of the United States west of the Appalachian Mountains. Pinckney’s Treaty, signed with Spain on October 27, 1795, gave American merchants “right of deposit” in New Orleans, granting them use of the port to store goods for export. Americans used this right to transport products such as flour, tobacco, pork, bacon, lard, feathers, cider, butter, and cheese. The treaty also recognized American rights to navigate the entire Mississippi, which had become vital to the growing trade of the western territories. In 1798 Spain revoked this treaty, prohibiting American use of New Orleans, and greatly upsetting the Americans. In 1801, Spanish Governor Don Juan Manuel de Salcedo took over from the Marquess of Casa Calvo, and restored the U.S. right to deposit goods. Napoleon Bonaparte had gained Louisiana for French ownership from Spain in 1800 under the Third Treaty of San Ildefonso. But the treaty was kept secret. Louisiana remained nominally under Spanish control, until a transfer of power to France on November 30, 1803, just three weeks before the formal transfer to the United States on December 20, 1803. Another ceremony was held in St. Louis a few months later, in part because during winter conditions the news of the New Orleans formalities did not reach Upper Louisiana. The March 9–10, 1804, event is remembered as Three Flags Day. James Monroe and Robert R. Livingston had traveled to Paris to negotiate the purchase of New Orleans in 1802. Their interest was only in gaining control of New Orleans and its environs; they did not anticipate the much larger acquisition which would follow. The Louisiana Purchase was by far the largest territorial gain in U.S. history. Stretching from the Mississippi River to the Rocky Mountains, the purchase doubled the size of the United States. Before 1803, Louisiana had been under Spanish control for forty years. Although Spain aided the rebels in the American Revolutionary War, the Spanish didn’t want the Americans to settle in their territory. While the sale of the territory by Spain back to France in 1800 went largely unnoticed, fear of an eventual French invasion spread nationwide when, in 1801, Napoleon sent a military force to secure New Orleans. Southerners feared that Napoleon would free all the slaves in Louisiana, which could trigger slave uprisings elsewhere. Though Jefferson urged moderation, Federalists sought to use this against Jefferson and called for hostilities against France. Undercutting them, Jefferson took up the banner and threatened an alliance with Britain, although relations were uneasy in that direction. In 1801 Jefferson supported France in its plan to take back Saint-Domingue, then under control of Toussaint Louverture after a slave rebellion. Jefferson sent Livingston as an envoy to Paris in 1801 after discovering the transfer of Louisiana from Spain to France under the Third Treaty of San Ildefonso. He was authorized to purchase New Orleans. In January 1802, France sent General Leclerc to Saint-Domingue to re-establish slavery, which had been abolished in law and in the constitution of the French Republic of 1795—both in France and its colonies—to reduce the rights of free people of color and take back control of the island from Toussaint Louverture, who had maintained St. Domingue as French against invasion by the Spanish and British empires. Before the Revolution, France had derived enormous wealth from St. Domingue at the cost of the lives and freedom of the slaves. Napoleon wanted its revenues and productivity for France restored. Alarmed over the French actions and its intention to re-establish an empire in North America, Jefferson declared neutrality in relation to the Caribbean, refusing credit and other assistance to the French, but allowing war contraband to get through to the rebels to prevent France from regaining a foothold. Throughout this time, Jefferson had up-to-date intelligence on Napoleon’s military activities and intentions in North America. Part of his evolving strategy involved giving du Pont some information that was withheld from Livingston. He also gave intentionally conflicting instructions to the two. Desperate to avoid possible war with France, Jefferson sent James Monroe to Paris in 1802 to negotiate a settlement, with instructions to go to London to negotiate an alliance if the talks in Paris failed. Spain procrastinated until late 1802 in executing the treaty to transfer Louisiana to France, which allowed American hostility to build. Also, Spain’s refusal to cede Florida to France meant that Louisiana would be indefensible. Monroe had been formally expelled from France on his last diplomatic mission, and the choice to send him again conveyed a sense of seriousness. A slave revolt in Saint-Domingue (present-day Republic of Haiti) had been followed by the first French general emancipation of slaves in 1793-94. This led to years of war against the Spanish and British empires, which sought to conquer St. Domingue and re-enslave the emancipated population. An expeditionary force under Napoleon’s brother-in-law Charles Leclerc in January 1802, supplemented by 20,000 troops over the next 21 months, had tried to reconquer the territory and re-establish slavery. But yellow fever and the fierce resistance of black, mulatto, and white revolutionaries destroyed the French army. This was the culmination of the only successful slave revolt in history, and Napoleon withdrew the surviving French troops in November 1803. In 1804 Haiti became the first independent black-majority state in the New World. As Napoleon had failed to re-enslave the emancipated population of Haiti, he abandoned his plans to rebuild France’s New World empire. Without sufficient revenues from sugar colonies in the Caribbean, Louisiana had little value to him. Spain had not yet completed the transfer of Louisiana to France, and war between France and Britain was imminent. Out of anger against Spain and the unique opportunity to sell something that was useless and not truly his yet, Napoleon decided to sell the entire territory. Although the foreign minister Talleyrand opposed the plan, on April 10, 1803, Napoleon told the Treasury Minister François de Barbé-Marbois that he was considering selling the entire Louisiana Territory to the United States. On April 11, 1803, just days before Monroe’s arrival, Barbé-Marbois offered Livingston all of Louisiana for $15 million, equivalent to about $233 million in current dollars. The American representatives were prepared to pay up to $10 million for New Orleans and its environs, but were dumbfounded when the vastly larger territory was offered for $15 million. Jefferson had authorized Livingston only to purchase New Orleans. However, Livingston was certain that the United States would accept the offer. The Americans thought that Napoleon might withdraw the offer at any time, preventing the United States from acquiring New Orleans, so they agreed and On Saturday, April 30, 1803, the Louisiana Purchase Treaty was signed by Robert Livingston, James Monroe, and Barbé Marbois in Paris. President Jefferson announced the treaty to the American people on July 4. After the signing of the Louisiana Purchase agreement Livingston made this famous statement, “We have lived long, but this is the noblest work of our whole lives…From this day the United States take their place among the powers of the first rank.” The Louisiana Territory was vast, stretching from the Gulf of Mexico in the south to Rupert’s Land in the north, and from the Mississippi River in the east to the Rocky Mountains in the west. Acquiring the territory would double the size of the United States, at a sum of less than 3 cents per acre. The United States Senate ratified the treaty with a vote of twenty-four to seven on October 20. On the following day, October 21, 1803, the Senate authorized President Jefferson to take possession of the territory and establish a temporary military government. In legislation enacted on October 31, Congress made temporary provisions for local civil government to continue as it had under French and Spanish rule and authorized the President to use military forces to maintain order. Plans were also set forth for several missions to explore and chart the territory, the most famous being the Lewis and Clark Expedition. 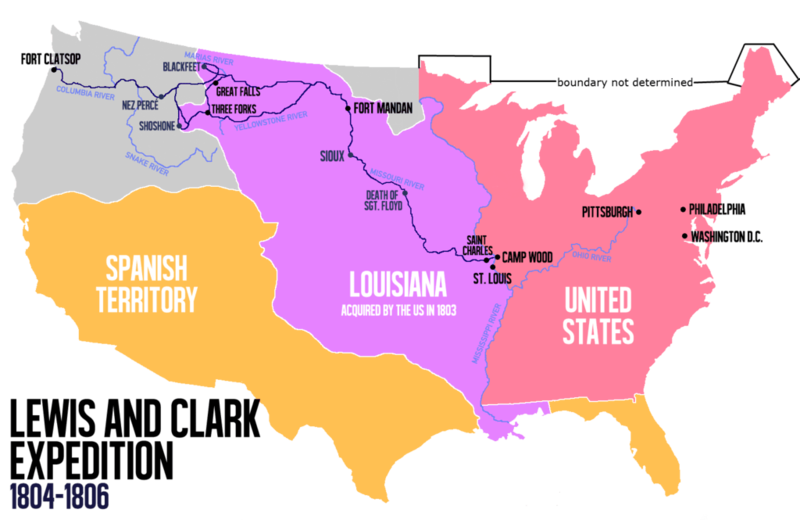 The United States claimed Louisiana included the entire western portion of the Mississippi River drainage basin to the crest of the Rocky Mountains and land extending southeast to the Rio Grande and West Florida. Spain insisted that Louisiana comprised no more than the western bank of the Mississippi River and the cities of New Orleans and St. Louis. 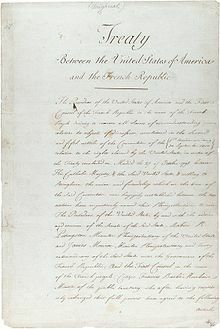 The dispute was ultimately resolved by the Adams-Onis Treaty of 1819, with the United States gaining most of what it had claimed in the west. Louisiana Creole cuisine is a style of cooking originating in Louisiana, United States. It blends French, West African, Amerindian, Spanish, Portuguese, and Italian influences, as well as general Southern cuisine. The Cajuns (descendants of French immigrants originally from Canada) largely assimilated and adopted Creole cuisine for their own. Although the Creole cuisine is closely identified with New Orleans culture today, much of it evolved in the country plantation estates of southern Louisiana. Despite its aristocratic French roots, Creole cuisine does not include Garde Manger or other extremely lavish styles of the Classical Paris cuisine. There are two types of Creole cuisine: Urban Creole and Rural Creole. Urban Creole is prepared mainly for New Orleans tourists. Rural Creole cuisine is often hidden in the bayous and swamps of the Old Creole Parishes although you can get it in New Orleans if you know what you are looking for. Since the 1980s, Rural Creole cuisine has largely been mistakenly labeled as Cajun cuisine. The African influences, which are extensive, came about because many of the plantation cooks were African or Creole of African descent. They brought with them the use of hot peppers and okra, which is called “gombo” in some West African languages. The importance of rice with many creole dishes was also influenced by African cooks as well as the layers of flavors in Creole cooking techniques. The indigenous people of Louisiana introduced powdered sassafras leaves, also known as filé, a thickening agent used in gumbo, along with corn dishes like maque choux. The Portuguese, Spanish, and Italian influences on Creole cuisine were the wide usage of citrus juice marinades. The Portuguese, Spaniards and the Italians also used tomatoes extensively, which had not been a frequent ingredient in the earlier French era. Pasta and tomato sauces arrived during the period when New Orleans was a popular destination for Italian settlers (roughly, 1815 to 1925). Many of them became grocers, bakers, cheese makers and orchard farmers, and so influenced the Creole cuisine in New Orleans and its suburbs. 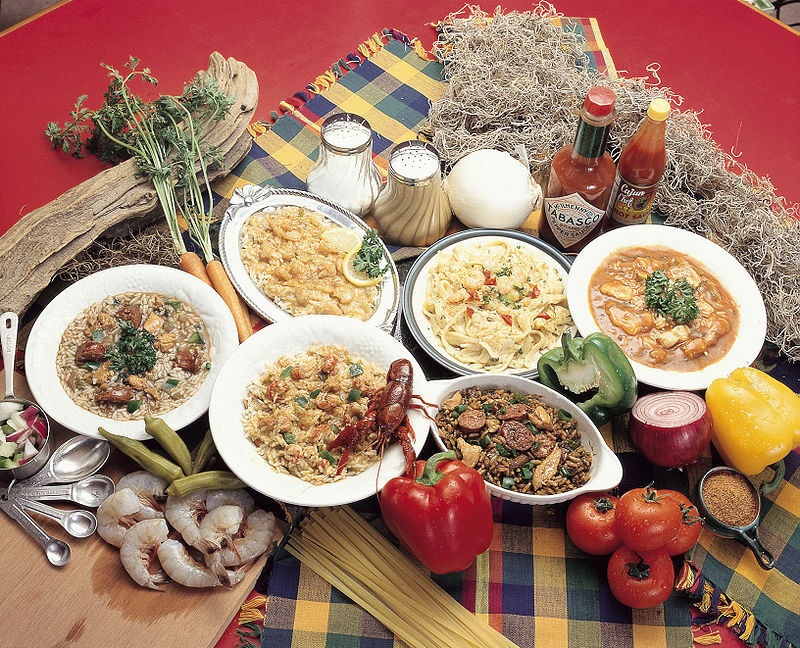 Starting in the 1980s, Creole cuisine began to be relabeled Cajun cuisine. An example of this relabeling is by Chef Paul Prudhomme. A national interest in Creole cooking developed, and many tourists went to New Orleans expecting to find “true” Creole food there (being unaware that the city was culturally and geographically separate from the Old Creole Parishes/Acadiana). The “New New Orleans Cooking” of celebrity chef Emeril Lagasse includes Creole dishes, both rural and urban. In his writings and TV shows, Lagasse draws the distinction between the misnomer “Cajun” for rural Creole and urban Creole – not bad for a chef from Massachusetts of Portuguese origin. I visited New Orleans and southern Louisiana quite often for several years some years ago. First stop was always for a dozen (or two) oysters on the half shell, fresh shucked at the bar at a local oyster joint; then on to somewhere for jambalaya, gumbo, red beans and rice, crawfish and crab boil, or what have you. One relatively modern (i.e urban creole) dish I liked for breakfast/brunch was Eggs Sardou. Eggs Sardou is poached eggs, artichoke bottoms, creamed spinach and Hollandaise sauce. 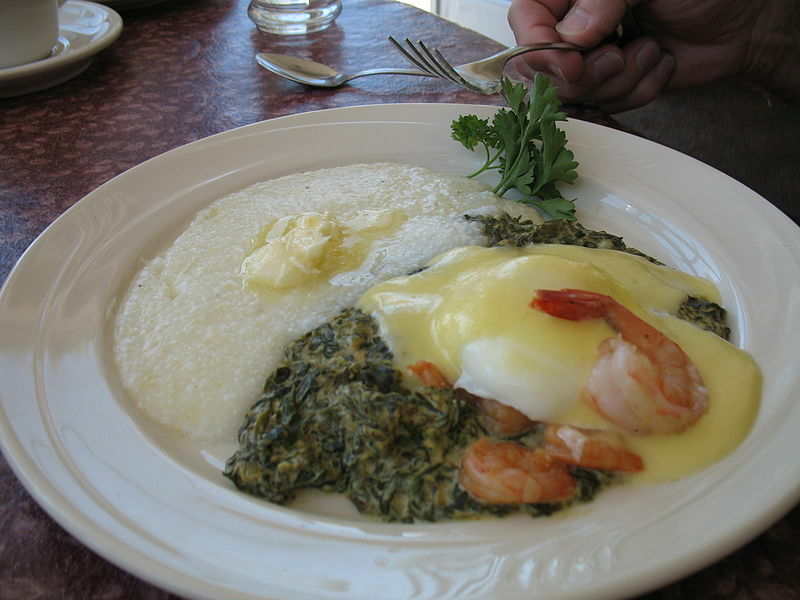 It is on the menu of many Creole restaurants in New Orleans, including Antoine’s, where Eggs Sardou was invented. Eggs Sardou is named for Victorien Sardou, a famous French dramatist of the 19th century, who was a guest in New Orleans when the dish was invented. The Eggs Sardou served at Antoine’s Restaurant nowadays include truffles, ham, and anchovies topping the hollandaise. The dish requires both béchamel and hollandaise sauces, recipes for which you can find in the HINTS section here (tab top left). Place a layer of chopped poached spinach creamed with béchamel on a warmed plate. Place two heated artichoke hearts (use a slow oven) on the spinach, and place a poached egg in each (runny yolk). Smother with hollandaise and garnish with what you will – truffles, diced ham, crawfish. These eggs must be made to order, piping hot. Antoine’s usually serves the eggs with grits for a full meal. As an appetizer you can omit them. Some buttered toast is all I need. In his time, this is the most important document signed by Thomas Jefferson. He almost doubled the size of the United States with one stroke of his pen! Indeed, although historians may disagree about “most important.” It’s also true that while the U.S. overnight doubled in size it took a long time, and many wars, before the territory was fully integrated. What would North America look like now if Napoleon had not been strapped for cash back then?